It's January 2011 and approximately a decade since I bought my first mobile phone. Looking back, it's amazing to see how much technology has changed in these 10 years! This is a companion post to the piece I wrote about portable music devices that I have owned through the years. I have a lot of fun making these nostalgic, trip-into-the-past kind of posts and I hope you enjoy them too! Cellphones were around in 1998, when I just started working. I remember doing a market research project for BPL Mobile which was then India's leading cellphone company. The outgoing call rates were then Rs. 16 to Rs. 25 per minute, depending on which plan you were signed up for. Incoming call rates were Rs.8 to Rs.12 per minute. Needless to say, only businessmen/doctors/ lawyers etc. who really needed connectivity, would buy cellphones and of course, so did the ultra-rich status-seeking types. Handset costs were also high - initially Motorola and Ericsson handsets were available at prices starting from Rs. 10000. I think I bought my first cellphone in 2000. It was a Nokia 5100 (5190 in USA) for which I paid the princely sum of Rs. 5000 and I was very kicked with it. Incidentally, my first operator was Orange and I paid Rs. 6 per incoming call and Rs. 2 for outgoing calls. Nokia started making the 5x series in 1998 and discontinued it in 2001. In 2003, I passed this phone to my mom and she kept it for another 4 years. Compared to the earlier phone, this one weighed a modest 133 gms only. I remember being excited to buy it because it was so small and light, and I could even hang it around my neck when I was out for fieldwork! Talk about tying a millstone around your own neck :). I cannot remember the price, but I think it was still around Rs.5000. Anyway, the other superior features of this phone included a monochrome graphic display on the screen, screen saver and welcome message on start up. And it would also have a silent/ vibrate mode. Needless to say, I was very kicked with all these small things. Here are the full specs from GSM Arena. My first departure from Nokia land yielded mixed results. I certainly got a sleeker, more feature-loaded handest than I would have gotten from Nokia at that price range. And when I saw the SE User Interface, which was vibrant and youthful, I realised how much Nokia UIs were lagging behind. Actually, I think the writing was on the wall for Nokia way back then. Although their lower end handsets were selling on brand name, young people had tonnes of more vibrant choices from Motorola and SE in the same price range. Today, Micromax etc. perform the same role. And it was exactly this factor that tempted me away from Nokia, though I love Nokia phones! Anyway back to the phone. I had posted this review of it on mouthshut around 6 months after buying it. I was not very happy, but I was by then ready to upgrade my phone within a year without regrets. However, it was the first, in fact the only phone I have ever owned that I had to take to a repair centre. And I am afraid that I have not bought a SE phone after that. This has to be the most nondescript handset I have ever owned because I cannot remember anything about it. Except that I became very bored and changed it within a year. Nothing was wrong with it, it just bored me. I can't be bothered to even search for a picture for this one! If I remember, the only reason I bought it was because it was under Rs.5000 and it was a Nokia. I was running away from my trouble-ridden SE handset, back towards reliability. When I bought this, I was eyeing a BlackBerry, but I was put off by the high price premium and the fixed data plans offered with it. I saw the superb reviews of this handset and it became my next choice. This has to be my favorite out of all the handsets I have owned. It represented many firsts for me. First time I spent more than Rs.10,000 on a cellphone. First QWERTY phone - and Nokia makes a fab QWERTY keyboard. First phone with push mail. I had been eyeing this for some time, but I did not buy it until the prices became reasonable. I eventually bought it at Rs10,500 (exchange price). Anyway, this handset made me fall in love with Nokia all over again. Much love. It was a sturdy beast with a fabulous battery life. I gave it away to my Dad who is happily flaunting it on BSNLs 3G network. 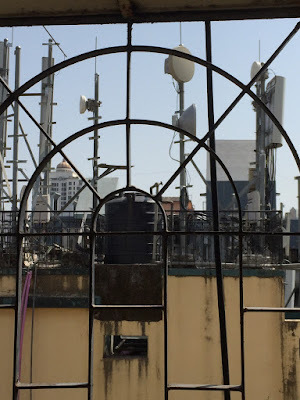 It pinches that we do not have 3G yet in Mumbai. Incidentally, this two year old phone is still available at Rs.8500 and I think it's a great buy, better than many later handsets that Nokia has launched. It's a solid budget QWERTY. Specs from GSM Arena. If I loved it so much, why did I give it away within a year? Too many new things beckoned - better hardware, new user interface, devices with more internet-friendly operating system. The world of apps and widgets. I had my eye on Samsung Wave from when it was announced. At my budget, I could have bought an Android with mid-level hardware or the Wave with top-end hardware and the dubious bada OS.I guess my choice taught me something about myself - given a choice between hardware and software, I went for the hardware. You can read about why I bought the Wave. I am still happy with my phone, but now I realise that I miss two things - QWERTY and a larger screen. Looks like the next phone needs to have both! 1) I have always had a budget threshold, linked to how much value I attach to a cellphone in my life. Initially I would not pay more than Rs.5000, then it was Rs.10,000 and now it is Rs.20,000. It was email and internet access that pushed my budget up, as well as acknowledgement of the increase in processing power and hardware specs. 3) I always buy below the curve, and wait for the price of best selling models to drop before I get them. 4) Out of my ten years of cellphone usage, I have been loyal to Nokia for 9 years! I have never had a bad experience with them till date. Yet, unless they get onto Android, I don't think I will buy another Nokia phone, and I feel bad about that. Operating system+brand will drive my next purchase and brand alone is not enough to take a decision. Thanks for reading, Moush. I too went down nostalgia lane reading and remembering...all the bosses had 5100, so I bought it too! But 3310 was really an awesome phone. I too kept mine for the longest time. nice read.i bought my first phone nokia 3315 for $100 in taiwan,in 2003. i was working on a ship .i was really exited and spent all night researching it though there was no network at sea.i used it may be for 4 months and gave it to my sister when i was at sea again.although i dont use it is still in working condition with the original battery.would always keep it no matter how may more advanced phones i own now.i share the same view would always stick to nokia if it is symbian or android bcz of the hardware and the toughness.has never let me down till date.hope nokia is comming out with android in the future other than the crappy windows. Hi, thanks for sharing your Nokia story! Everyone I know has a special corner in their hearts for their first Nokia phone, which is so different from today's 'use and throw' attitude towards mobile phones. I just saw the Lumia 800 in the store and it's a beautiful phone. Hope Nokia does find their way back in a post Android era.